India: Should India become a signatory to the Hague Convention on international child abduction? Bring our Kids Home (BOKH) is a non-governmental organisation in the US formed in 2015 by parents, including many Indians and Indian-Americans. The members of BOKH are aggrieved parents (mostly fathers) who have been lobbying with US government officials in Congress and the State Department to urge the Indian government to become a signatory to the 1980 Hague Abduction Convention, which provides a way to return a child internationally abducted by a parent. According to the Hague Convention, such abduction may occur when a parent removes a child from his or her country of habitual residence in violation of the other parent’s custodial rights, even in cases where the parents are married or neither parent holds a custody decree prior to the abduction. At the annual US-India consular dialogue coming up on September 27 at Washington, DC, the US government will push the Indian side to accede to the Hague Convention. “Protection and welfare of American citizens overseas is one of the issues that we address. Cases where, following the break-up of a marriage, one parent takes away a child from the US without the consent of the other and often in contravention of a US court order, are of great concern. We hope that India will accede to the Hague Convention of which 96 countries, including the US, are already signatories,” a senior US official said in Delhi last week. There are currently 94 such cases of child abduction from the US to India, the second highest number after Mexico. While India will have representatives from the Ministry of External Affairs, Ministry of Women and Child Development and Ministry of Home Affairs at the consular dialogue, the US side will be represented by the US Departments of State and Labor. Sanjay Singh (name changed), an active member of BOKH, welcomes the US government’s stand. A finance professional in the East Coast of the US, Singh’s ex-wife did not return from India with their son after a trip for a family wedding in 2012. He is fighting a complicated cross-border legal battle over the custody of their son who is now eight. “All three of us are US citizens and our habitual residence is America. In not bringing our son back to the US, my ex-wife is guilty of having violated three orders seeking my son’s immediate return to New Jersey and custody of our son to me. 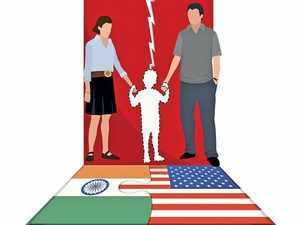 But the Indian law on the other hand doesn’t even acknowledge that a parent can abduct a child,” a dejected Singh told ET Magazine from his home in the US. He is unhappy that over the last five years he has had limited access to his son and is missing out on the child’s growing up years. “Young children are the most vulnerable in these parental abduction cases because they lack the maturity to understand the trauma that is unfolding in their lives and the complete breakdown of a family system.” Singh believes that India acceding to the Hague Convention will be a welcome first systemic step in acknowledging the fact that the country is becoming a safe haven for parental abduction of children, and a formal legal framework to address issue is needed. Anand Raghavan, a British citizen of Indian origin, also belongs to the group of left-behind parents. His wife left the UK with their daughter, who is now eight, in July 2015 and later informed him on email that she would not be returning. While the Delhi High Court initially ruled in 2016 that the child should be returned to the UK since she was a citizen of that country and a habitual resident there, earlier this year the Supreme Court overruled the judgment. While India’s signing the Hague Convention will not personally benefit Raghavan, as the conditions of the Convention apply only up to a year after a child has been taken away, he supports it. That’s because, he reckons, the guidelines will ensure regulation of which country has jurisdiction over a child and a timely return to the country of habitual residence of the child prior to the abduction. Not being a signatory to the Hague Convention means there are no set guidelines on international parental child abductions, leaving judges to adjudicate based on their own discretion. Currently, a committee of 13 members, which was set up in March 2016 under the chairmanship of Justice Rajesh Bindal of the HC of Punjab & Haryana, is looking into the Draft of the International Child Abduction Bill, 2016. The committee is holding discussions and inviting suggestions from stakeholders to build safeguards for parents as well as children, in the event of India signing the Convention. “The committee, set up at the behest of the Ministry of Women and Child Development, is going back to the drawing board and could recommend changes in the Hague Convention guidelines. We are open to a new law or even a new system that will address all concerns of Indian women, who may be facing abusive marriages outside India, and their children,” said a senior official from the ministry. He added that the Indian government had no obligation to sign the convention in its present form and the Indian social and legal system would always be of the greatest importance when a change in law was addressed. “Before India becomes party to the Hague Convention, we have to put in place a strong mechanism with built-in checks and balances. Creating a central authority, with a judge to head it, which will receive all applications on parental child abduction and removal and facilitate return and exchange is in the interest of India,” says Anil Malhotra, a counsel specialising in inter-country child removal matters and co-author of India, Inter-Country Parental Child Removal. Divorce lawyerMalavika Rajkotia is of the firm opinion that India should not sign the Convention. “Until recently, India had taken a principled stand against the Convention. It must remain firm in its resolve. The Indian Supreme Court is already empowered to provide recourse and remedies to aggrieved parents in such cases,” Rajkotia told ET Magazine. It is now largely accepted that in recent years, primary caregivers — a majority of whom are mothers — have been the “abducting parent”. This fact has also been recognised by the Law Commission of India in its 263rd report, which states that globally 68% of the abducting parents were mothers, 85% of them being the primary caregivers. “Mothers are more likely to remove their children and leave the place of habitual residence because they are often trapped in abusive marriages abroad, with no financial security to fight exorbitantly costly divorce, maintenance or custody litigation. In such a situation, returning to their country of origin by surreptitiously fleeing from their abusive husbands is often the only option open to them,” adds Rajkotia. She adds that the US legal standards, which treat mothers, who are often victims of matrimonial violence, as offenders and abductors of their own children, is not suitable for Indian women and children. She also feels that Indian men who are abusive towards their spouses often get away because the US legal system goes soft on white collar workers.